While suicide bombings appear frequently in today's news media, they are nothing new: the first recorded suicide bombing took place in March 1881 to assassinate Tsar Alexander II, and the practice has since expanded to a global phenomenon. 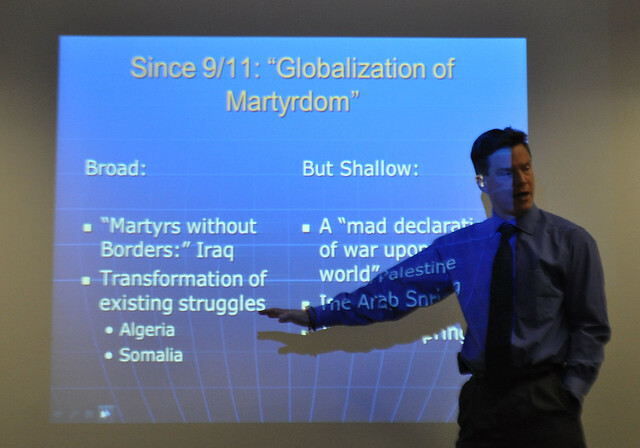 Terrorism scholar Jeffrey Lewis discussed this history of the phenomenon at START's headquarters during his talk, "The Human Use of Human Beings: A Dynamic, Integrative Understanding of Suicide Bombing," on May 2. The talk complements his well-received book, "The Business of Martyrdom," which he began as a START post-doctoral student under Laura Dugan's mentorship. Lewis argued that suicide bombing is a form of technology "that has been invented and re-invented at different times in different areas but always for the same purpose: resolving a mismatch in military capabilities between antagonists by utilizing the available cultural and human resources." Traditionally, Lewis said, suicide bombings relied on a "culture of martyrdom" to draw in perpetrators; individuals were willing to die for their beliefs and their causes portrayed them as noble and admirable after their deaths. "If someone was willing to die while killing others, it opened up possibilities," he said. Not all suicide bombers were voluntary martyrs, Lewis noted, as the emperor of Japan choose non-military citizens to be kamikaze pilots during World War II. Lewis also discussed what he believes is the main reason the number of suicide bombings has declined since 2007 ? the culture of martyrdom is not widespread. He said that Muslims do not share the culture that exists within violent Jihadist groups, and there are limited resources a single group can pull from to continue suicide bombings. Lewis believes it is important to understand suicide bombers as components within a much larger system shaped by a host of social, cultural and operational constraints. Lewis's book is available now on Amazon here for more on the history and culture of suicide bombing.